In this post I would like to give a few examples of my experience grappling with non disclosure and enclosure of spaces of contestation surrounding oil industry operations. The first example, as Kimia Ghomeshi and I have documented in greater detail via Antipode Foundation, concerns our attempt to access detailed information on Canadian government financing (through Export Development Canada) to controversial pipeline projects, including the Keystone XL and Northern Gateway. That experience underlined that substantive access to the specifics of Canadian corporate activities financed via government channels is unavailable to both the research community and the general public, expressing overall regulatory capture (at multiple scales) by the interests of the hydrocarbon industry. Under an increasingly financialized economy, and the (albeit volatile) rise of minerals and hydrocarbon investment that followed 9-11 and later the 2008 financial crisis, substantive democratic checks on over-exploitation by capital are compromised in increasingly obvious forms. “You will, I imagine, already be aware from your close relations with Shell in the context of the Nigerian war, that Shell are also fuelling the planes carrying the airlift into Biafra from Sao Tome. This presents them with a minor conflict of interest. “This is a slightly tricky problem as I see it, in that the question of supplying aviation fuel for flights of all kinds from Sao Tome is a matter of Shell’s Commercial operations and interests. We should therefore have to be on firm ground of national interest if we were to seek to move Shell to change their present commercial practice. On this criterion I should have thought that we should encourage Shell to provide fuel for the relief flights, but that (if this could be done separately) they should be dissuaded from assisting the arms flights. Inter alia, I should have thought that the Company’s standing in Nigeria generally would suffer substantially were the Nigerians to become aware of the assistance given to arms flights by Shell in Sao Tome. On a subsequent visit to Kew, I found the box containing this correspondence had been de-indexed and thus inaccessible to the public unless one had the box number already (which is File FCO 67 212). The file was also much disorganized, which my colleague Dr. Ike Okonta in Nigeria indicated had been his experience with other materials pertaining to the Nigerian civil war. I was advised, informally, that this was not accidental and that I should make a copy of every page in that box, a further example of which may be viewed above. The third example is drawn from my observations at the environmental impact hearings held under the auspices of the 2012 Joint Review Panel concerning the Shell Jackpine Mine Expansion in the Alberta Tar Sands. This project was ultimately approved, but has been firmly opposed by the Athabasca Chipewyan First Nation (ACFN). The hearings process, in its tribunal form, is highly exclusionary – successful intervention in that process is severely limited by the expectation that opposing interveners would be represented by legal counsel. Among other observations made by Asume Osuoka and myself with regard to the materials under review, an anecdote from the hearings in Northern Alberta in the winter illustrates the overall power dynamics between the firm and opposing First Nations and Metis. Following an electrical blackout at the hearing venue, elders from ACFN waited outside at the venue for an hour, while Shell staff were allowed entry by security. But most telling was that the week immediately prior to the start of the hearings – in October 2012, Shell bought the naming rights for the facility via a 2.5 million dollar partnership. The extension of MacDonald Island Park, the sports facility at which the hearings took place, was to be named Shell Place, shifting the terrain in favour of corporate marketing. The general public, including First Nations and Metis with historic rights to the affected land, thus attended regulatory processes nominally aimed at protecting their interests, in a building held by the corporation whose project was under consideration. Upon approaching the hearings a billboard reading ‘Future Home of Shell Place’ was visible on the entry road to the facility. These kinds of dynamics have clear material consequences for decision-making under formally liberal-democratic processes. For excellent analysis concerning how transparency discourse is applied inequitably and problematically to Canadian First Nations, see Shiri Pasternak’s crucial work. A final example concerns the erosion of labour protections in the oil industry in Mexico, as foreign industry participation in the offshore oil sector deepens. This creeping denationalization has been ongoing for some decades, and accelerated under recent oil and energy sector reforms under the Felipe Calderon and now Pena Nieto administrations. In conducting interviews regarding these issues on various occasions over the past decade, I have met workers engaged on offshore platforms who described nasty conditions, but were constrained from reporting this through non-disclosure clauses in their contracts. Workers who had been involved in an organizing drive on privately managed platforms had been black-listed, and had received threats. These dynamics have been described at length by labour rights organizations such as CEREAL and the Union of Technical/Professional Workers in Oil Industry (UNTyPP) in Mexico, and in a report published by the International Transport Workers authored by the award-winning Mexican journalist Ana Lilia Perez. “My use of the word transparency is meant to emphasize the fact that information will travel instantly and without obstruction, equally clear and perceptible to everyone. I am not describing the sort of transparency that is demanded when critics insist that windows into business or government operations be held open in order to enforce accountability” (de Kuijper, 42). Anna Zalik is an Associate Professor in the Faculty of Environmental Studies at York University. She thanks Sonja Killoran-McKibbin for very helpful comments on this piece. On October 1st, 2012, Isaac Asume Osuoka and I submitted a letter to the Joint Review Panel hearing on the proposed Shell Jackpine Mine Expansion in Northern Alberta.We attached the following evidence to our letter: The 2011 UNEP report on Ogoniland and the Amnesty International 2012 Briefing on Canada to the UN Committee on the Elimination of Racial Discrimination. On October 4th Shell’s lawyers filed a letter seeking to exclude many people from presenting evidence at the hearings. Isaac Asume Osuoka and I were among them, as was Keith Stewart of Greenpeace. The letter may be viewed at http://www.ceaa-acee.gc.ca/050/documents/p59540/82081E.pdf. On October 17, the Joint Review Panel indicated that we did have standing to present evidence at the hearing, but that material concerning Shell’s practices in Nigeria was not to be treated substantively. Justin Podur and I first wrote this in February 2012. This piece concerns a downstream facility across from York University that stores fuel used at Toronto filling stations, via Montreal refineries and elsewhere. We intend to write more “reports from Sentinel Road” on matters of shared interest. On a different end of the production chain, hearings concerning Shell’s proposed Jackpine Mine Expansion in Alberta are ongoing. Having recently returned ‘downstream’ from those hearings in Fort McMurray, it seems apt to post this now; more on those hearings in a subsequent post. In July 2010, the Toronto Transit Commission recommended that City Council exempt a petroleum tank farm on Keele Street from a 1954 by-law that prevents oil and gas trucks from traveling over subway lines (1). Today, plans for the subway extension to York University intersect with the Keele Street tank farms of Imperial Oil/Esso, Shell and Suncor. The TTC’s recommendation for an exemption is based on improvements to truck safety since 1954. And as “the tank farms won’t be going anywhere” anyway, it is also practical to change the rules. City Council agreed – in August 2010 they granted the exemption (2). See http://www.torontosun.com/news/torontoandgta/2010/07/08/14651326.html and http://www.toronto.ca/legdocs/mmis/2010/cc/bgrd/backgroundfile-33276.pdf. This also involved re-design of nearby roads to accommodate tanker traffic. The tank farm, for those who don’t live near it or pass it on the way to work or school in the morning, is owned by a who’s who of Canadian petroleum interests: Imperial Oil and Imperial Oil pipelines, Shell Oil, Sun-Canadian Pipe Line Company, Trans-Northern Pipelines Inc., Enbridge Pipelines (3). Built in the 1940s, the facility stores fuel that ultimately supplies local filling stations (3a). The debate between the TTC and City Councillors concerned risks of spills, collisions, explosions, and fires (4). Proponents argue that the facilities are too expensive to move and the risk of an explosion is below acceptable levels. But petrochemical facilities raise other concerns – for example, toxicity. In 1991, Health and Welfare Canada (HWC) investigators raised concerns of contamination of fruit and vegetables grown near the tank farms. A toxicologist from the Ontario Ministry of Environment and Energy sampled fruits, vegetables, and soil on September 23, 1991 and found no evidence of contamination beyond slightly elevated levels of lead – again, like the acceptable levels of explosion risk, the lead was found to be below acceptable thresholds (5). Even if all of the analyses to date have found the tank farm’s risks to be in the acceptable range, it would be nice to know much more about it. How does it benefit the city, and the local community – what are the benefits to be weighed against these acceptable risks? How have toxicity analyses come out in the 20 years since the 1991 study? 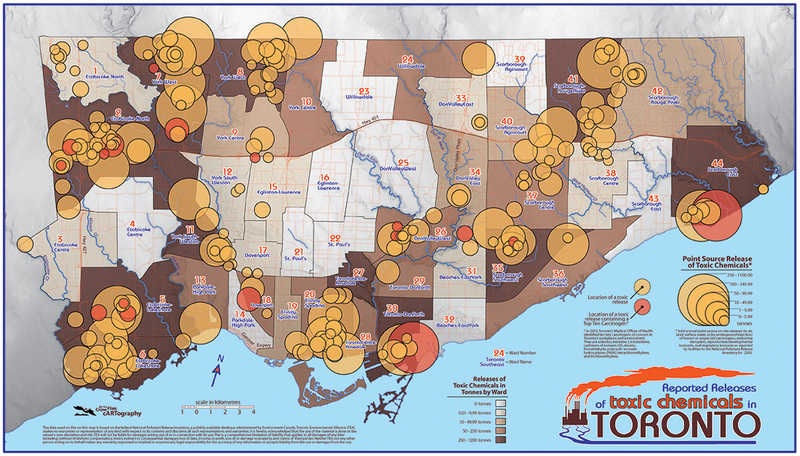 A 2003 Map produced by The Toronto Environmental Alliance illustrates a high concentration of industries releasing toxic chemicals in Toronto’s North West and North East, with a significant mark for the area that comprises the Tank Farm detailed in the tables linked here. If we compare this map to material from the Color of Poverty project, we note a correlation between communities of lower income, racialized communities and toxic chemicals. From the perspective of the literature on Environmental Justice, this is unsurprising. Our review of the National Pollutants Release Inventory for the past 10 years, indicates an overall increase in the air contaminants released over time from the Imperial Oil, Shell Canada Products and Suncor facilities for the years up until 2009. The data for the Shell Facility indicates a 23% increase in VOCs released between 2009 to 2010, from 39 to 48 tonnes. Also of note – these facilities are likely to store fuel imported from a range of controversial sites. One possibility for an updated study: using toxicity and safety risk metrics from comparable facilities elsewhere, analyze the problem spatially – what buffer is required for safety from possible spills and explosions? Who lives within that buffer? What risks are posed by the pipeline network, and what might the role of alternative energy be in the future – could this facility be decommissioned? From where are the products at these locations sourced and what socio-environmental conflicts (problems) do we find at the other end of the production chain? 1) David Nickle, July 15, 2010. “Oil tankers slide closer to Keele and Finch: Council to review bylaw banning oil and gas trucks from intersection”. http://www.insidetoronto.com/news/cityhall/article/848069 Accessed February 15, 2012. 3) City of Toronto. Bus-Only Lanes Downsview Station to York University Class Environmental Assessment. http://www.toronto.ca/wes/techservices/involved/transportation/downsview_york/ Accessed February 15, 2012. 3a). Brian Gray. 2008 “The City Cannot Run on Empty”. Toronto Sun. August 18, p5. Accessed November 15, 2012. 4) Toronto Transit Commission. July 14, 2010. Report: Transportation of Inflammable Liquids Over Subways – City of Toronto By-Law Exemption. http://www.toronto.ca/legdocs/mmis/2010/cc/bgrd/PW34.8b.pdf Accessed February 15, 2012. 5) J. Craig Kinch. 1991. Phytotoxicology Assessment Survey in the vicinity of the Shell, Petro-Canada and Imperial Oil Petroleum Tank Farms, Toronto – 1991. ARB-251-92-Phyto. http://www30.us.archive.org/details/phytotoxicologya00kincuoftI Accessed February 15, 2012. Ghomeshi, K and A. Zalik. 2013. “Corporate Privacy and Environmental Review at Export Development Canada” Intervention to Antipode Foundation site. We made this piece available while the NEB Hearings on the Enbridge Line-9 Pipeline were unfolding in Toronto. See the full article at the Antipode website, via the link. Designed by: Beaudoin Media Designs.